Progressives decried the decision. Leftists pointed out Pence’s plethora of policy stances and decisions that have threatened civil rights, women’s health, the environment, and the welfare of the most vulnerable since he was elected to Congress in 2000 and then as Indiana’s governor in 2012. As a Congressman, Pence consistently voted true to his climate denial, voting to prevent the EPA from regulating greenhouse gases, to reverse President Obama’s Offshore Moratorium Act, and against enforcing limits on global carbon dioxide emissions. He was also a vocal critic of the Clean Power Plan, insisting in a letter to President Obama that Indiana would not comply. Pence has also expressed doubt regarding evolution. “Do I believe in evolution? I embrace the view that God created the heavens and the earth, the seas and all that’s in them,” he said on MSNBC in 2008. The law, which Pence said he signed “with a prayer,” makes Indiana the second state in the nation, after North Dakota, to ban abortion in cases where a fetal anomaly is detected. Last year, Pence signed into law the so-called “Religious Freedom Restoration Act” that gave “legal cover, under the guise of ‘religious liberties,’ to any businesses or individuals who wish to violate anti-discrimination laws,” as Common Dreams reported. Pence and Indiana Republicans capitalized on a decades-long manipulation of “religious freedom” as an excuse to exclude and punish groups they see as immoral or repugnant, leveraging religion’s perquisites to create a bubble of legitimated pre-Civil Rights Era prejudice (and tax avoidance). Only Pence and company went too far: Indiana’s RFRA didn’t just protect religious intolerance from government interference but actually empowered business to discriminate against immoral other folk without risk of civil rights lawsuits. Only, when pressed even to answer yes or no as to whether Pence had just signed a bill that legalized religious discrimination of gays, he sputtered and retreated. Typically, the Onion did the best job of anyone when it came to nailing him to a wall. Did search of Congressional record& discovered Pence= Bush’s chief Iraq propagandist. Many pundits pointed out the contradiction between Trump’s and Pence’s stances on the Trans-Pacific Partnership (TPP) trade deal. 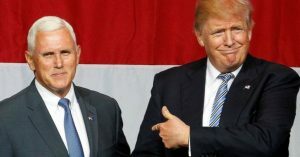 “Before he became governor of Indiana and a candidate to be Donald Trump’s vice-presidential nominee, Mike Pence was a congressman, and he voted for every free-trade agreement that came before him,” the Washington Post wrote. [Pence’s] positions on immigration are anti-immigrant and anti-family. If Donald Trump wasn’t enough to alienate Latino voters, a Trump/Pence ticket will be the ultimate deal breaker for one of the fastest-growing demographics. Trump’s VP Mike Pence is Don’t Ask Don’t Tell on gays in the military. Trump is just Don’t Ask Don’t Tell on his tax returns. Perfect match. Pence is going to help Trump with voters who can’t decide if they’re more worried that gay people will get wedding cake or health care. ← What’s Going On in Turkey?